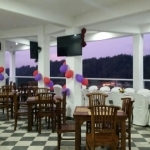 All our rooms are equipped with A/C, LED 32inch TV, Safe box, Tea /Coffee making facilities, a Hair Dryer , Hot/Cold Water , a private balcony overlooking Kandy City and the Lake, Guest supply ( toothpaste, soap), free drinking water bottles and Intercom telephone and a Mini Bar. As a standard, all the area is with free WiFi facilities and own car parking. We also provide shared accommodations and free meals for drivers who accompanied our guests throughout the stay.